As I've stated before I am horrible about eating breakfast. Most mornings I grab a cup of coffee and nothing else until lunch. The one exception is if I have baked scones. I love scones and they are one of the few breakfast foods that I will always eat. Since I make scones approximately once a month, I am always looking for new recipe ingredients. The November issue of Woman's Day magazine had a recipe for Easy Scones using lemon-lime soda, which looked unusual and perfect for a weekday breakfast. This recipe has 3 ingredients. It takes a total of 30 minutes, 10 of which is active and makes 8 servings. I made a few modifications to this recipe. First, I used sierra mist soda, since it was what was on sale the week that I made these scones. For flavor I added dried cranberries, approximately 1/2 cup. I love fruit scones and the cranberries give a nice sweet/tart element. Finally, instead of spooning the dough, I hand patted the dough into a circle and cut into eight triangles. Before putting the scones in the oven I brushed the tops with heavy whipping cream and sprinkled with granulated sugar. I followed the remainder of the recipe as written. My two boys got a kick out of this recipe. I had never used lemon-lime soda in a scone recipe, so I was intrigued by the concept. 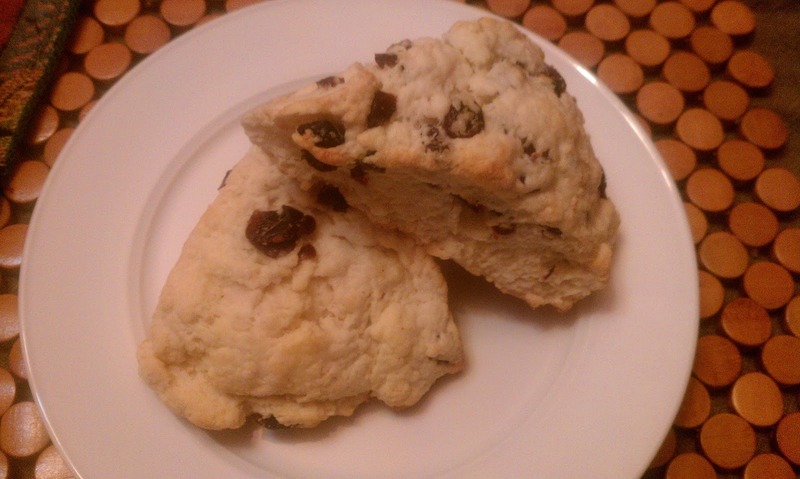 The scones turned out moist and delicious and the dried cranberries made a delicious addition. The best part of the recipe is that it only has 3 ingredients (4 if using dried cranberries). A very quick and easy scone recipe, that turns out light and perfect for breakfast. For the recipe go to Easy Scones. We are horrible about breakfast here too. These look so good. Had to stop over and comment after I saw the post on facebook. YUM! about eating breakfast I love lemon-lime soda it is too good, when i have made it in my home.. for my wife ..Keep up the good work. looks yummy! I can never skip breakfast... I am starving when I wake up and if I skipped I would either pass out or be the BIGGEST grump! @Michelle I love scones with butter also, yum!